Never too hot to touch! Uses less electricity than a light bulb! The Toasty Toes provides thermostatically-controlled heat to your feet and legs. At work warm legs and feet promote productivity, eliminating the distractions and complaints of cold temperatures. Use at a desk, conference room, lunch room or bathroom, shipping table, security or ticket booth, repair shop, airplane hangar, drive-thru window, production line,or evern refrigerated work areas. At home, warm extremities are beneficial to everyone, but especially older adults and arthritis sufferers. More heat lessens pain and stiffness, relaxes muscles, and improves circulation and metabolism. Use in a study, workbench, basement, garage, porch, craft room or anywhere you need to be seated or standing for a long period of time. 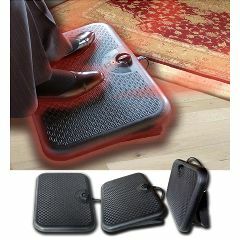 Three easily adjustable positions for added convenience: mat, ergonomic footrest, and vertical heat panel. It's handy dial provides easy control and the 6' cord plugs into any 110v outlet. No harmful carbon monoxide off-gassing! Energy efficient: Uses less electricity than a light bulb! These keep your feet and legs nice and warm. Our office isn't heated sufficiently and these have worked wonders. Great to add warmth in sub-basement office. do you accept PayPal for purchases?